As you may know, five of Kat’s Viper nameplates will be sold at the second BSG live auction in May. Kats boxing gear from Season Three’s ”Unfinished Buisness” in which a boxing match is held on Galactica. Kat wears these gloves in her match. These are Kat’s ”hero” gloves and other boxing items. Set includes mouth guard, gloves and wrapping tap. Gloves are blue with adjustable straps. Mouth guard is soft plastic. 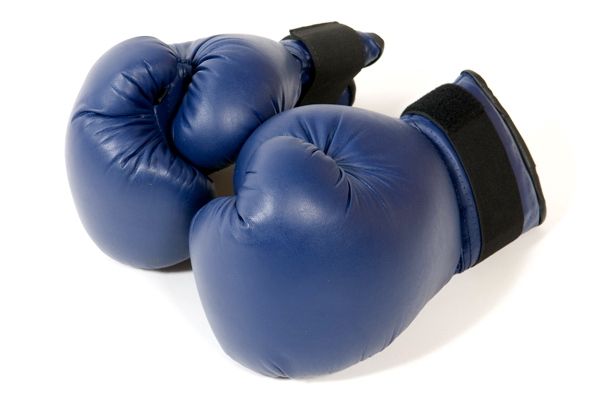 Hand wraps are a nylon/spandex material. Wraps measure about 2” in diameter. Mouth guard measures about 3” long. Gloves measure about 12” long. Bidding on this item will end Sunday, April 26, at 8.50 pm PDT. Meanwhile, pictures of Luciana wearing the boxing gear can be found in these galleries. Good luck to all bidders!